BIM is fast becoming the Holy Grail in facilities and asset management. But how is BIM being applied in the real world today? Is it working? What results are being achieved? This buildingSMART Australasia Seminar will address these questions and more with a case study presentation from the Sydney Harbour Foreshore Authority (SHFA) on the century old heritage-listed Pyrmont Bridge, a major Sydney landmark that attracts more than five million pedestrians each year. 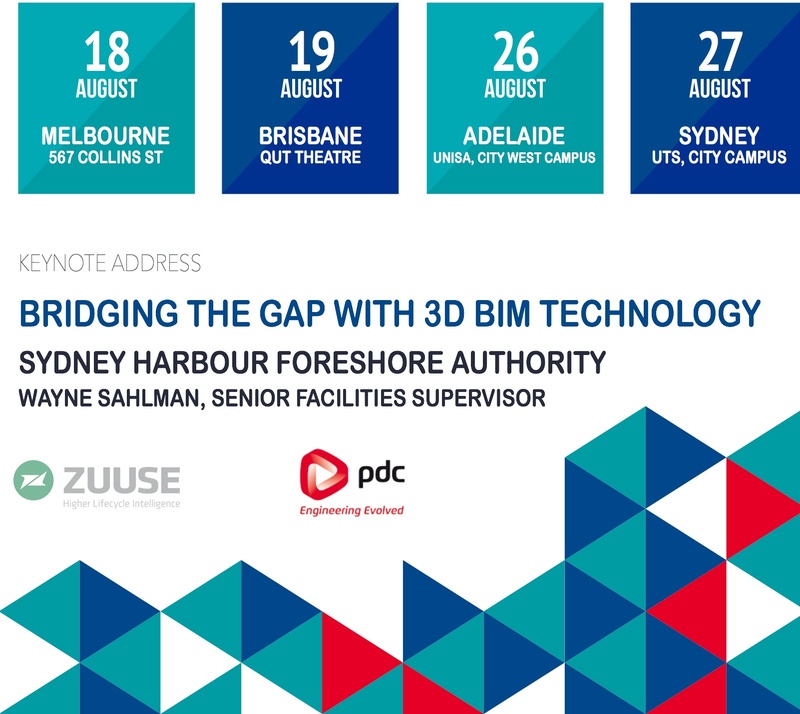 Wayne Sahlman, Senior Facilities Supervisor at SHFA, will present a case study on the 3D BIM solution that has been implemented for the Pyrmont Bridge. The evening will close with a panel discussion. Places are limited in each location, please follow the below links for further event specific information or to book your ticket online! When Richard Petrie joined buildingSMART as chief executive officer in 2013, he took on the goal of driving the standards-writing organization’s growth — in order to drive change across the entire architecture, engineering and construction industry. Having worked in construction as both contractor and client, Petrie has seen firsthand the frustrations of a slow-to-evolve architecture, engineering and construction industry. From within buildingSMART — a not-for-profit organization that has been working to standardize the language and processes of BIM (Building Information Modeling) users since 1995 — Petrie has observed an increasing emphasis from several European governments on improving construction efficiency. buildingSMART is setting out to provide that data by leading the entire building industry into the digital economy. There are two key challenges in architecture, engineering and construction industry that buildingSMART is seeking to address. First is the fragmentation of the supply chain.12 As designers, builders and owners expand their focus to the entire life cycle, it becomes increasingly important to understand how each component and system impacts others. While savvy suppliers are integrating vertically, providing inter-related products, services and knowledge, many designers are finding the information they need through sharable information made possible by BIM. Second, Petrie finds, construction clients are rarely well informed about the construction, building management and asset ownership process, which means they are also fragmented. For example, the efficiency to which buildings are designed isn’t always met in operation. This is in part because product data isn’t easily transferred from designers and builders to owners and facility managers. “Altogether, this disjointed relationship with clients and the fragmentation of the supply chain is a great drag on the transformation of the industry,” Petrie says. buildingSMART describes openBIM as a “universal approach” to the collaborative design, realization and operation of buildings based on open standards, such as its IFC family of standards. This approach allows all project members to participate in modeling, regardless of the software tools they use; it creates a common language for widely referenced processes; and it provides one system for housing asset data over its entire life-cycle. Petrie sees openBIM as a solution to the industry’s fragmentation challenges and buildingSMART as a path to the significant opportunities for improvement in building and infrastructure cost, value and environmental performance. With its newly defined vision, the volunteer-driven organization has made major headway in the past year. From creating new standards to defining data to the harmonization of processes across the supply chain, the group has demonstrated real progress and results. The group’s push for progress aligns with demand from several governments. As a case in point: Petrie indicates the UK government’s push for interoperability as an example of where openBIM is heading. While the UK has had requirements for open data since 2012, in 2016 the government will formally launch a program in which procurements must use BIM Level 2 documents. This set of methodologies is designed to introduce the construction supply chain to trading and operating in a data environment, allowing the government to focus on the strongest leaders and drive value for its spending programs. It’s a demand driven not by technology, Petrie says, but a cultural shift resulting from seeing real change in how each construction dollar is spent. “That is the reality that will provide the real driver to ensure that this program moves forward the way we hope it will,” he says. Petrie adds that thus far the group is achieving its predicted targets in the UK, and work is underway for a Level 3 program slated for 2020-2025. To expand the organization’s work, Petrie is seeking to build a community of experts to ensure that future standards accurately reflect the needs of real-world users. Volunteers work at both the international and chapter level, in an integrated process for developing new standards and deploying them into user communities. Membership in buildingSMART International is open to companies, government bodies and institutions from around the world. Dassault Systèmes joins buildingSMART as an International Member, with full voting membership rights on the new Standards Committee and membership rights with buildingSMART chapters. The company joins other leading proponents of openBIM that recognize the benefits from openBIM can achieve the greatest impact and momentum by working together in a common community. Members benefit from the collective activities of other members locally and internationally, and play an active role not only in identifying issues, but also in the development of solutions. The nature of buildingSMART is that it is a voluntary organization where solutions are developed on a mutually supportive co-developed basis, and so we need members to be active in our community,” Petrie explains. Petrie acknowledges that it will take time to develop and communicate the organization’s mission, but, he adds, “The changes that we are hoping will be available as a result of these new standards will not only affect the technical communities, but will have implications for the way in which companies function. This entry was posted in Uncategorized and tagged EAM, FM, IFC4, OpenBIM on August 8, 2015 by rumbelom.